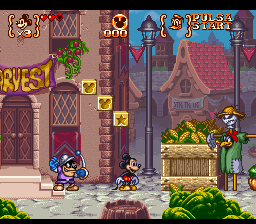 Magical Quest 3 starring Mickey and Donald is the third series in the Disney-inspired platformers made by Capcom in the 1990’s. 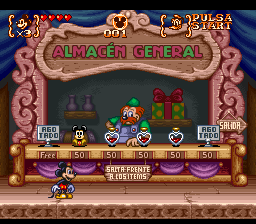 The game plays just like The Magical Quest and The Great Circus Mystery: Go through levels and gain new costumes that empower you with new skills. The evil King Pete is up to his old tricks again. When the guardian fairy of Storybook Land fell asleep, King Pete and his minions took it over and are now plotting to take over the real world as well. 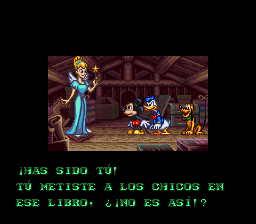 Not only that, Pete has kidnapped Donald’s nephews Huey, Dewey and Louie to use as his slaves. Now that Mickey and Donald have found out about King Pete’s terrible plans, will they be able to save Donald’s nephews and restore peace to Storybook Land before it’s too late…? 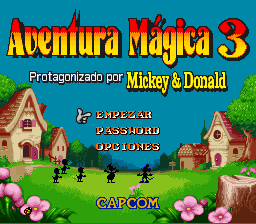 Spanish Translation for “Mickey to Donald: Magical Adventure 3” for the Super Nintendo. Based on the English Translation by RPGONE. 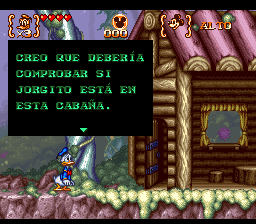 Thanks to Jonny of RPGONE for all the work done, both in the font and in the graphics, adding the special characters of Spanish and changing the title screen.